University Press of Mississippi, 9781628461053, 176pp. 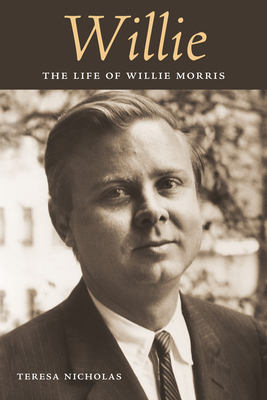 In 2000, readers voted Willie Morris (1934-1999) Mississippi's favorite nonfiction author of the millennium. After conducting over fifty interviews and combing through over eighty boxes of papers in the archives at the University of Mississippi, many of which had never been seen before by researchers, Teresa Nicholas provides new perspectives on a Mississippi writer and editor who changed journalism and redefined what being southern could mean. More than fifty photographs--some published here for the first time, including several by renowned photographer David Rae Morris, Willie's son--enhance the exploration. From an early age, Willie demonstrated a talent for words. At the University of Texas at Austin, he became a controversial editor of the Daily Texan. He later studied history as a Rhodes Scholar in Oxford, England, but by 1960 he was back in Austin, working as editor for the highly regarded Texas Observer. In 1967 Willie became the youngest editor of the nation's oldest magazine, Harper's. His autobiography, North Toward Home, achieved critical as well as artistic success, and it would continue to inspire legions of readers for decades to come. In the final tally, he published hundreds of newspaper and magazine articles, along with twenty-three books. His work covered the gamut from fiction to nonfiction, for both adults and children, often touching on the personal as well as the historical and the topical, and always presented in his lyrical prose. In 1980, he returned to his home state as writer-in-residence at the University of Mississippi. In 1990, he married his editor at the University Press of Mississippi, JoAnne Prichard, and they made a home in Jackson. With his broad knowledge of history, his sensitivity, and his bone-deep understanding of the South, he became a celebrated spokesman for and interpreter of the place he loved.